As a fan of tea history, I first came across Bruce Richardson's name as the co-author of a book I reach for often, A Social History of Tea. Since then I've noticed his name pop up on numerous books, lectures, tea history sites, and as the co-owner of Elmwood Inn Fine Teas with his wife Shelley and son Ben. Last month I had the pleasure of speaking with Bruce face to face at the NY Coffee & Tea Festival, and knew he'd be a perfect person for a blog interview. As expected he's very knowledgeable about all things tea, but also fine art, music, and travel. 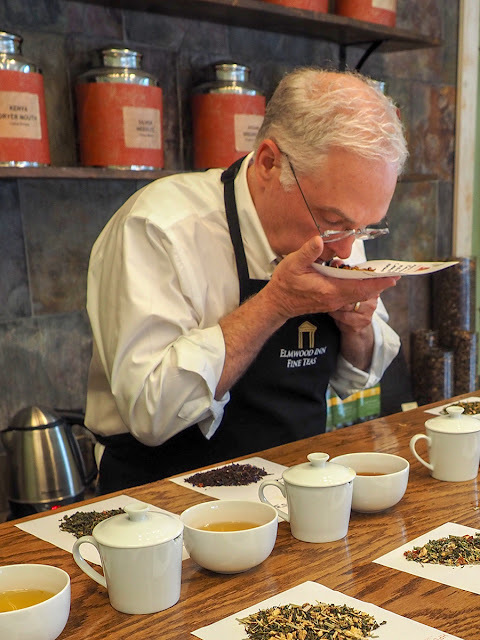 Read below for our interview, including one of his most memorable tea adventures, and a special personal tea ritual. You are a prolific teacher of all things tea. What is one of your most favorite tea subjects to discuss? I enjoy storytelling, so I naturally love to share the history of tea and interesting tales of famous – and not so famous – tea personalities. I have a master’s degree in education and am equally at home speaking about tea in a college art class as I am in talking to an audience at World Tea Expo or at a museum lecture series. Stories of tea can be woven into so much curricula, such as art, music, politics, geography, economics and literature. You’ve worked on some of my favorite tea books. Do you have a favorite? I am most proud of the work I put into editing and designing my 2011 edition of The Book of Tea by Okakura Kakuzo. First published in 1906, the book was translated into several languages and was a mainstay in the libraries of both artists and philosophers. Many teaists owned copies of the original work but few understood how the book came into existence, or the incredible story of Okakura’s life which led from Yokahama to Boston and a thousand points between. I spent years tracing the author’s footsteps through Kyoto, Uji and Tokyo, as well as his favorite haunts in Boston, such as the Museum of Fine Arts and the Isabella Stewart Gardner Museum. I was the first to tie the book’s influence to such American artists as Georgia O’Keeffe and Frank Lloyd Wright. I am most happy when readers tell me they finally understood the Book of Tea after they read my introduction to the fascinating man who wrote it. How did you first get into tea and tea history? I’ve used historical snippets to begin teaching session at my TEA MasterClasses, which I’ve hosted since 1999. Then, a decade ago, the National Archives asked me to design a historical tea to sell in the Washington gift shop. I did a lot research on the teas tossed into Boston Harbor in 1773 before we produced that product. The designers of the new Boston Tea Party Ships & Museum eventually discovered me through the National Archives connection. Boston asked me to come aboard as their consultant and tea master just as the museum was being built. I was delighted to contribute to the historical accuracy of this iconic event in America’s history. I also guided the museum in designing their Abigail’s Tearoom, and their private label teas served in the tearoom and gift shops. Over a million visitors from around the world have passed through the museum since it opened. As a master in tea etiquette, what is one of the biggest etiquette misconceptions associated with afternoon tea? Too many people look at etiquette as a list of rules. This puts pressure on the diner. I like to think of etiquette affording the diner the ability to relax because they possess a set of skills that can be used in myriad situations. Being a musician, I think of it as a pianist feeling at ease on stage because they invested hours in learning scales at an early age. Etiquette training has given me the skills I need to enjoy tea comfortably in settings across England, China, Japan, India and Sri Lanka. Good manners and awareness of the local culture are important in all those instances. I love following your Tea Master’s Blog. How do you find the fascinating historical content that you write about? I try to find stories that no one else is telling. I have new tea experiences daily which give me plenty of fodder for writing. I just wish I was more disciplined into putting those countless adventures on paper! Can you share one of your most memorable tea adventures? I traveled a couple of years ago to Japan’s famed Kawane region in search of Tsuro Tsuchiya, one of the last true warriors of traditional style Shizuoka tea. Tsuchiya’s grandfather planted tea bushes on his steep mountainside farm a century ago. Now in his 60s, Tsuchiya introduced me to some of those original tea bushes that continue to thrive in this fertile soil. He is one of a declining number of tea farmers who carry on traditional growing methods, including some hand plucking. Tsuchiya’s 400-year-old home is filled with a row of gold medals he has won at the World Green Tea Contest. We sat on straw mats in front of a brazier that provided a bit of heat and comforted us from the January cold as we sipped multiple infusions from tiny white cups. Of course, I didn’t speak Japanese and Tsuchiya spoke no English, so I couldn’t verbally tell him what I was experiencing. Nonetheless, we were communicating through our eyes, our breath, our pauses. Okakura Kakuzo would say we experienced the “cup of humanity”. This ancient beverage is the communal cup of the world which binds all teaists together in a fraternity that needs no words to communicate the language of the heart. What is your next tea project? I have spent nearly a year traveling back and forth to China designing a line of teas for a Shanghai-based fashion design house. The brand will be launched with a runway show in Shanghai on June 3. I will spend a couple of weeks in China beforehand speaking at the Hangzhou Tea Expo and the SIAL Shanghai exhibition. If you could pick one favorite tea room in Britain, which would it be and why? I love the Bridge Tea Rooms in the Roman village of Bradford on Avon, just outside Bath. For a London tea experience, you can’t beat Claridge’s. Jane Pettigrew and I sometimes meet there as we plan book projects. Currently, I love sharing tea with my four-year-old grandson Davis. He wants to have tea every time he visits us – which is at least once a week. He’s a big fan of single-estate, tippy grade Assam with a generous splash of milk. Thank you Bruce for taking the time out from your busy schedule for this interview! We had so much to chat about at the NY Coffee & Tea Festival, and I look forward to reconnecting at this year's World Tea Expo! For more interviews with tea people, visit the roundup here!